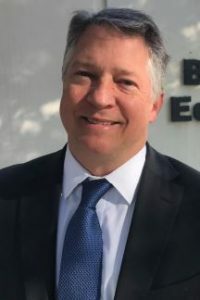 Since joining the board in 2015, he has served on a number of panels including the Bond Oversight Committee, the Parcel Tax Oversight Committee, the Joint-Use Committee, the NGSS (for Next Generation Science) Committee and many others. He was unanimously selected as board president on Dec. 13, having served the previous year as vice president. Before that, Kuszyk was on the La Cañada Educational Foundation board for 4½ years, started the summer reading program at Palm Crest Elementary called iRead (and managed it for six years), worked on the district’s first two parcel tax campaigns, and helped relaunch the La Cañada High School Alumni Association. Kuszyk, who has two children in the school district — 7th- and 10th-graders — is a classical musician, college professor and strategic marketing consultant who has worked extensively with local nonprofits. Recently, Kuszyk, a La Cañada Kiwanis Club member, sat down to discuss 2018 and look ahead to this year while grabbing a quick bite to eat at Panera Bread. What do you think the district’s biggest challenge will be in 2019? Our biggest challenge this year is implementing the bond projects. There are a lot of moving parts and we have all these different projects at different stages. We’re really trying to move to get projects ready for summer construction. So we’ll be doing the security, the fencing and the security upgrades at the elementary schools this summer. That’s definitely going to happen. I’m on the Palm Crest design committee, the Palm Crest design is the first one we’re working on, and we’re working on [the sewers]. I was a Palm Crest parent for 10 years, so we’ll appreciate that. The projects at the high school, the band room, that’s pretty small scale, and then there’s the pool. We’re just starting to talk about the high school pool. What would you like to see the district accomplish in 2019? For 2019, one of the big things we’ll be opening is the wellness center. At the high school we have an RFP [Request for Proposal] out, and it’s going to be a room at the high school. We’re real excited about this. They’ve been researching and visiting other wellness centers at high schools and colleges. This will be really good for our students and ties into everything with the safety and security and the Challenge Success. It’s supposed to open the beginning of next school year. I don’t think we have it all figured out how we’re going to handle it but it will be a place where students can go and there will be outreach [may have peer mentors and counselors]. And there will be more implementation of the Challenge Success program. It will be spreading out more to the elementary schools. What are your personal goals as board president in 2019? The second thing is transparency. I want people to have confidence in the process. Due to the Brown Act, everything happens in public anyway. The third thing I really want is to be a place where people want to work. I want happy employees. Happy employees make happy students. One of the initiatives is the free memberships for the teachers at the YMCA. And then we’re going to be starting fitness classes on campus. So we’re looking for ways to make people healthier and also excited to come to work. The fourth issue we’ve discussed is strengthening our relationship with the other [private] schools in town for two reasons. One is the safety and security in the event there is an issue, and secondly, just communication. Why were you open to the idea of becoming board president? You could have said no, of course. Good question. It’s a great group of people. I don’t know if you sense that. It’s always down to business, but it’s the board and the administration, it’s really great to work with. Of all the facets of my life, it’s my favorite. It’s the favorite group of people I like to be around. I’m happy. I’m just honored they picked me. I’m happy to contribute. How important to you are high test scores and rankings on national high school lists? Where does that rank for you in importance? In regards to the test scores, I’d say it’s one measure we use. Of course they’re important, but they’re not an endgame. That’s not our only goal, to teach the tests. It’s one measure and … we’re always going to be happy if the test scores are high. That’s a good thing for everyone, but it is just one indicator. How closely will you be monitoring the Devil’s Gate sediment removal project, also called the Big Dig? We’ll be monitoring it very close. And we’ve hired an independent environmental firm [Nimya and Moore Environmental Consulting] that is conducting evaluations and going to give us recommendations. And we’re working closely with our parent experts and our legal counsel to look into all the mitigation strategies and try to be as responsive as we can for the staff and student health and safety concerns. We realize it has to happen, but we’re going to do our best to make sure the county upholds its word. What do you think of the current safety and security plans for all the school campuses? Are you satisfied? I’m definitely satisfied, but it’s a work in progress. I think we’ve done a lot. I’m really confident in what we’ve done. We’ve hired the Chameleon Associates safety firm. And then we formed the security and safety committee and we have five subcommittees on that. And we’ve had over 40 expert parents in the community. Law enforcement, legal, some from Homeland Security, so just experts that are serving on these committees along with teachers and administration/school board. We’ve been very aggressive on that this year, on the safety, the security, the wellness. And back to Chameleon — they’re working with the World Trade Center, they’re working with the United Nations, I mean huge organizations, and they’re really into preventative model of security as opposed to just reacting. Peter Crabbe from there has done trainings on all the campuses, done numerous trainings with the teachers, and parent nights. And then in terms of safety plans, we’ve updated our plans, and we have safety teams that have formed on each site to deal with specific events. Challenge Success, a program that looks out for the whole student, appeared to be successful last year, with “Building Your Path.” You had a hand in that. What do you hope students learned and do you plan to bring it back anytime soon? We’re thrilled. I think we’ll be entering the fourth year of the Challenge Success program out of Stanford [University]. It’s going really well. We have a group of parents and students that have gone up to Stanford multiple times and then under the direction of [interim La Cañada High School Principal] Jim Cartnal. And what came out of that was our late start [the bell schedule in 2017-18 changed to 8:30 a.m. from a previous 7:45 a.m. start]. I think we’re one of the few high schools in the state that starts this late. And that directly comes out of Challenge Success. Back to the “Building Your Path” [Challenge Success] event, I’m so happy we’re able to offer that. [Cartnal] was great and with [LCUSD Chief Technology Officer] Jamie Lewsadder they’ve committed to doing it in 2020 again. I always say La Cañada is the nexus between science and entertainment. With JPL, we have professors and engineers, there are so many interesting people, and I always felt growing up I wasn’t exposed to this. If we can recruit these parents to sign up and tie that in with the challenge success.… A lot of times it’s great for students to hear that they didn’t go to Harvard and get a dream job the next year. A lot of times they might have not gone to an Ivy League and they might have had two career switches, and they’re super-successful. For me, I always want to harness the power of this community. There are so many amazing people. What do you feel needs improvement in the district and how do you plan to fix it? I think we do really well at communications, but I’d like to see some improvements. And I think this is embedded in one of [Superintendent Wendy Sinnette’s] goals. A lot of things we’re talking about are Wendy’s goals that we set out, like communicating to our students so they know what’s going on and sometimes that includes figuring out how to reach them, whether it’s through an app, email or texting. I know with my kids it’s hard to get them to check email. We try also with our parents. We have the board newsletter. [LCUSD board member] Ellen Multari has done that the past few years, and we do have a Facebook page. We’re pretty good at emails but it’s just improving upon that and maybe upgrades to the website. We’re going to analyze that this year. We want to ensure the highest-quality teachers. California, overall, has a teacher shortage. When we go to the California school board convention, there are big districts with hundreds of positions unfilled. And we always have people apply. I think people want to work in La Cañada. So we’re working … how do we continue to try to get the best teachers? One way we’re doing that is Debra Cradduck, she’s executive director of human resources, she’s reaching out to college education schools. Like at USC, Azusa Pacific. So we want to establish relationships to have a pipeline of top teachers. That’s one thing we really want to work on. What is the school district doing right? I want to emphasize our community partnerships. Kiwanis does so much. Terrific Kids, Builder’s Club, JPL, JPL Academy, Assistance League of Flintridge. They’re intrinsically involved. The Assistance League runs the music programs at the elementary. When there were budget cuts some 30, 40 years ago, the Assistance League [stepped in]. They run the elementary music program. We’re really thankful for that. The YMCA also runs the youth and government program. It’s great. We have just a very strong arts program, as well as our positive coaching alliance. And then just the city of La Cañada — the city’s great. We have a Joint Use Committee. We have a really good relationship, so it’s mutually beneficial. Those are just a few things, but I wanted to get a few things in.